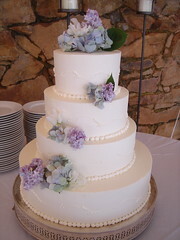 Unlike ordinary cakes, wedding cakes present us with the unique challenge of building a cake that not only tastes phenomenal, but retains its structural integrity amid the elements of time and temperature. Since 1995, we have found these combinations of flavors to appeal to even the most discerning wedding guest. Let us know if you have other preferences or ideas in the way of fillings or flavors. We will be happy to entertain them for an additional charge. 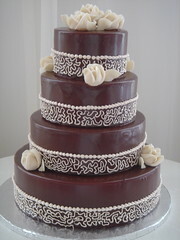 Made from almond paste and sugar, this Swiss confection is rolled very thin and draped over the top of wedding cakes. 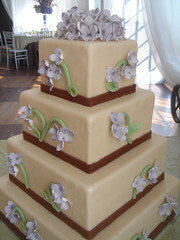 Its natural color is ivory, however, it can be colored to most pastel shades, and is often used to make various marzipan flowers and miniature fruit. Marzipan provides a smooth finish to the outside of the cake, and pairs best with vanilla cake and bavarian cream filling. 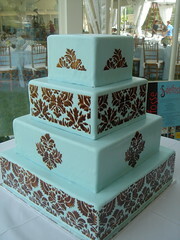 Buttercream is a more traditional icing used to finish the outside of most wedding cakes. While it does not color very evenly, it can be finished very smooth in either square or round. We make our Swiss style buttercream using premium European butter instead of shortening. This translates into a creamy, smooth icing that pairs well with either chocolate or vanilla cake. 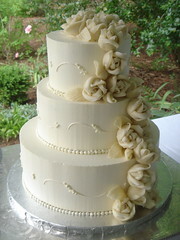 Our buttercream can also be flavored with dark or white chocolate. 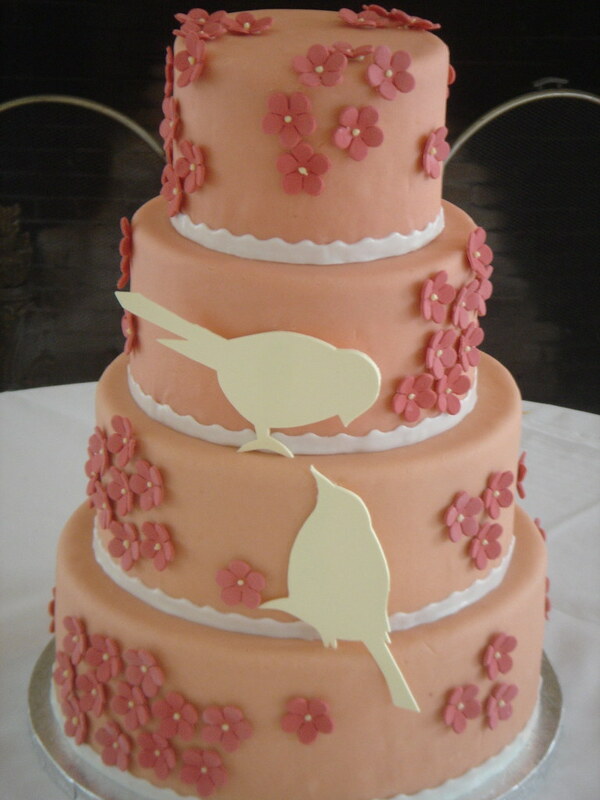 Rolled fondant is a sugar paste that is typically rolled out very thin and draped over the top of wedding cakes to create a smooth finish. 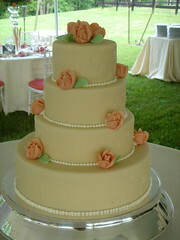 Rolled fondant is the alternative when marzipan is not an option, and if the cake needs to be pure white in color. 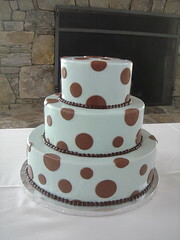 Although we use rolled fondant sparingly, it is most often used to create colored shapes and stripes. 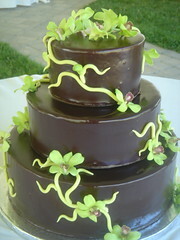 For a more untraditional look, we can glaze the outside of the cake with dark chocolate ganache to produce a shiny, chocolate finish. Chocolate glaze can be used to cover just about any type of cake, however, if it is paired with chocolate cake and chocolate chocolate ganache filling, the result is a luscious cake that is intensely chocolate.